Get Ready: Raine Inc. Day! This Monday, March 26th is “Make Up Your Own Holiday” Day. With that in mind, we are making March 26th Raine Inc. Day! Granted Monday’s are not usually a cause for celebration, but Raine Inc. Day would be, right? So, how should we celebrate? We know! 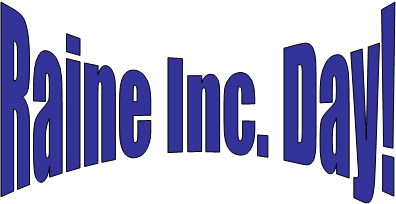 How about a Raine Inc. Day discount for all of our incredible dealers? All you would need to do is place an order and mention Raine Inc. Day and you will receive 5% off your total order*. That is definitely a reason to celebrate! You know what would make Raine Inc. Day even better? Let’s just celebrate the whole week! That’s right -we will give you 5% off your orders placed March 26th through March 30th* . You have to mention Raine Inc. Day in order to receive it though. If you place your order online, just put it in the comment section. For our retail customers, use the “Buy It Now” option and enter RAINE for your coupon code. We hope you will join in and let us know how you are celebrating Raine Inc. Day. *Discount does not apply to custom orders. This entry was posted in Grand Openings & Promotions by raineincblog. Bookmark the permalink.